The adult is on the left, and the child on the lower right. You can tell it’s not fully grown yet by the lighter color of its wings and the pale, speckled breast. 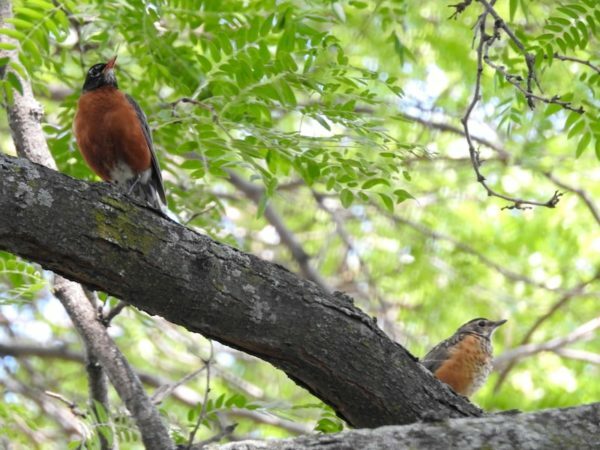 It’s summer, and birds of a certain age—too old to be fledglings and too young to be independent juveniles—are all around if you know where to look: usually upwards, particularly if you hear a high-pitched peep-peep. But I digress. 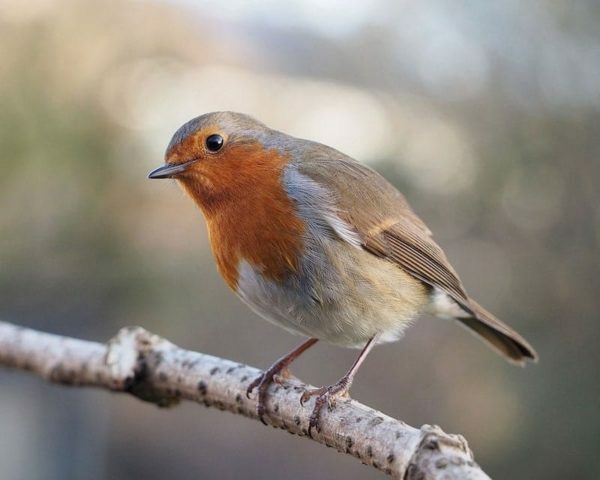 I was watching another, much smaller bird (a house wren, perhaps?–I needed binoculars to be sure and didn’t have them with me), when the motion of two robins kissing caught my eye. If you read my blog regularly, you have learned along with me that when two birds “kiss,” it’s twenty to one that it’s an adult feeding its offspring. So I did my usual thing of whipping out the camera, and soon after did my almost-as-usual thing of swearing under my breath, because by the time I had the birds in my sights, they were no longer sitting next to each other, but a few wingspans apart. I took about a bazillion shots with various aperture settings in hopes of getting both birds in focus *in the same photo,* but it was not to be. This is the best shot, with parent in crisp focus and baby a tad fuzzy around the edges.